Borja-Fisher, Business Development Manager for Western Fumigation, is a long-time member of the Port community. She recently sat down to discuss her plans for her one-year term, and some of the opportunities she sees for the WTA. The WTA was established to promote international trade between the Philadelphia region and the world, and today it fulfills that mission through educational, charitable, and networking events. Miriam, how long have you been a Board Member of the WTA? I joined the Board in 2008. I rose to First Vice President in 2014, and became President at our Annual Banquet last month. It's been a quick few years on the Executive Board, and I’ve really enjoyed it. Can you tell us, what are your goals for the World Trade Association of Philadelphia during your term this year? Let me say, I’m very excited to be the incoming President of the WTA. Overall, I’d like to maintain the mandate and vision of the WTA. This will involve enhancing the standing of the organization within the Philadelphia region; that is our first priority. Second, we need to continue to provide the excellent educational events and conferences that the WTA is known for. Can you give us an example of such an event? Yes, on November 6, we hosted one of the educational events that are part of our tradition, and which are so important for the trade and transportation community in our region. At our Monthly Meeting, we hosted Gregory J. McCann, Director, Agriculture & Prepared Products, Center of Excellence and Expertise (CEE), U.S. Customs and Border Protection. Mr. McCann gave a great overview of the new CEE, and its important work to streamline the food import process. Educational events like these really give a "value added" to our membership and the broader region. Miriam, what are some of the opportunities that you see for the WTA in the coming year? There are so many opportunities for our group and the trade and transportation industries in our region. 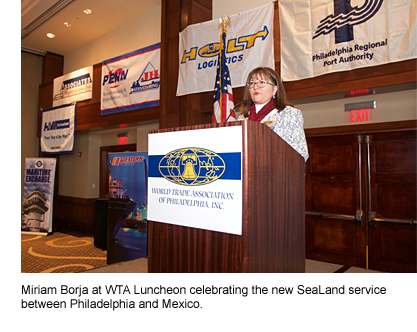 World trade is increasing, the ports of greater Philadelphia are growing, and our members need to know about the constant changes happening in these complex industries. So, there are plenty of topics for our Board to consider for our educational meetings. And we are very proud of the good work we have done for Autism Speaks. We have raised over $600,000 in the past 10 years through our charity events. There is so much more we can do to raise awareness—and funds—to understand this condition and help those who experience it. Finally, our networking events are important, too. This is a people business, and it helps to meet and get to know the people in other parts of the supply chain. Good personal relationships improve business effectiveness. The WTA is really the premier organization for trade and transportation in our region, and I look forward to bringing our community together. Finally, you and the other WTA Board Members and officers are all volunteers. Can you tell us about your day job? Western was founded in 1928 and we have been working closely with the Port of Philadelphia for close to 40 years, providing import/export quarantine treatments. Miriam, thank you for speaking with us today.